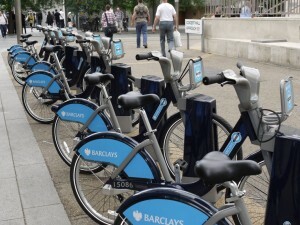 A new bike hire scheme designed to encourage thousands more cycle journeys has been launched in central London. Currently there are 5,000 bicycles, which are available at 315 special locations around the capital. The keys cost £3 and the cost of using the cycles varies from £1 for an hour to £50 for 24 hours. The 23kg bikes with three gears do not come with locks and TfL said this was done to deter people from keeping the cycles for long periods. They are automatically locked at the docking stations. London Mayor Boris Johnson said London had been, "filled with thousands of gleaming machines that will transform the look and feel of our streets and become as commonplace on our roads as black cabs and red buses. My crusade for the capital to become the greatest big cycling city in the world has taken a gigantic pedal-powered push forwards." Next time you are in London visiting SGI, why not try out the environmentally friendly bikes, instead of staring at all the miserable faces on the tube?